Jacqui's interview with Ven Robina Courtin, Sydney May 2009. Please be patient when listening to this interview. We get off to a stumbling start but it does get a lot better as the interview goes on! However, as you may notice when listening to the interview, anyone interviewing her needs to be on the ball if you want to keep up with her sharp mind. I suspect I failed that test but have left the interview complete with its stumbling blocks so that you can enjoy the texture of her clear mind as it meets with a duller state! This interview is with Ven. 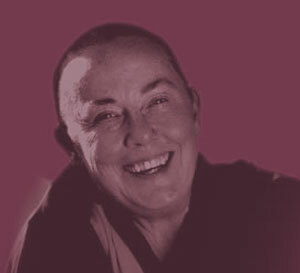 Robina Courtin, the travelling Australian Buddhist nun in the Gelugpa tradition who is also Director of the Liberation Prison Project. She has been a nun for the past 30 years and her work, particularly in the U.S., U.K. and Australia, has involved her in widespread teaching, activism and publicity. The Ven. Robina has had key editorial roles in Wisdom Publications and Mandala magazine, a worldwide Buddhist publication. As the director of the Liberation Prison Project, Venerable Robina and her staff bring Buddhism into prisons across the United States and in Australia, benefiting many hundreds of prisoners. This prison work was profiled in the award-winning documentary, Chasing Buddha. In this interview she talks about her work with prisoners; the different Western and Buddhist approaches to the mind; how Buddhism is currently manifesting in the West and reflects on supports for the ordained.